Holocaust Remembrance Day, which began at sundown tonight, is the day each year when Israel remembers the 6 million Jews murdered by Nazi Germany. May we never forget! Holocaust Remembrance Day is dedicated to honoring the memory of the Holocaust inflicted on the Jewish people by the Nazis and their accomplices and to acts of heroism and defiance against the German forces. This year’s focus is “1944: From Extermination to Liberation” – the Jews’ situation exactly 70 years ago. Peres further said: “We mustn’t ignore any type of anti-Semitic phenomena, any desecration of a synagogue or smashing of a tombstone. We must also not overlook the rise of extreme right-wing parties with neo-Nazi leanings that are a danger for everyone and a warning for every nation. 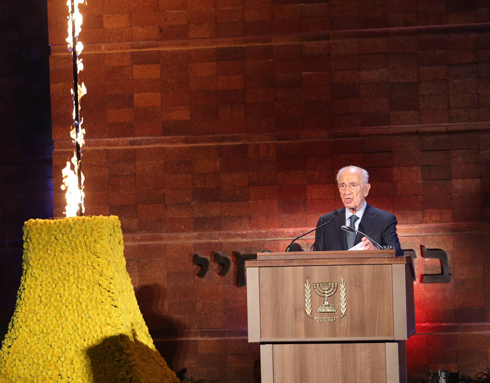 Prime Minister Benjamin Netanyahu wondered whether the world had learned the lessons from the Holocaust. “Why didn’t they see the truth? They didn’t want to deal with the consequences. They hoped to avoid a conflict at any price, and that’s how they laid the ground for the worst war in human history. Netanyahu attempted to connect the memorial day to current events, and slammed Iran’s nuclear program: “Iran is developing nuclear weapons. Today, as in the past, there are those who rationalize Iranian actions. Today, as in the past, those who think this are deluding themselves. This time too, the truth will lead the way. “Iran wants a deal in which the sanctions are lifted, but the nuclear capabilities remain. A deal that allows Iran to remain on the threshold of nuclear power will leave the entire world on the precipice. Tel Aviv will hold a remembrance ceremony at the Cameri Theater, titled “1944 – Jews t the Finish Line, From Extermination to Liberation”. 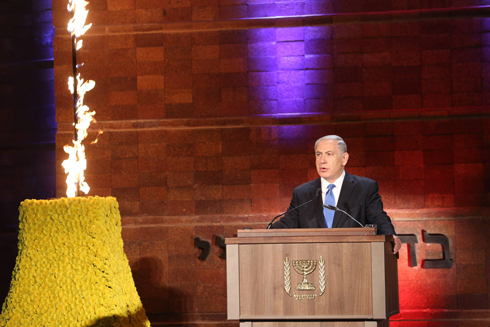 The ceremony will be screened live via a wide screen at the Tel Aviv Performing Arts Center. A ‘Singing and Remembering’ event will take place at 9 pm on Sunday at the Gerard Behar Center in Jerusalem and at 08 am Monday, the ceremony “1944 – On the Brink of Liberation” will take place at Safra Square in the capital. The main Remembrance Rally to mark the end of the Holocaust Memorial Day commemorations will be held on Monday at 7:30 pm at Kibbutz Yad Mordechai in the presence of Defense Minister Moshe Ya’alon, Opposition leader Isaac Herzog, IDF senior commanders and Hungary’s ambassador to Israel. The United States Holocaust Memorial Museum is also observing the 2014 Days of Remembrance from April 27 – May 4 . This video can be found on their website and is well worth watching all the way to the end. Retrieved from United States Holocaust Memorial Museum. The 2014 Days of Remembrance theme, Confronting the Holocaust: American Responses, marks the anniversaries of two seminal events in Holocaust history that raise questions about the responses of the United States to the widespread persecution and mass murder of the Jews of Europe. What can we learn today from American action and inaction in the face of the refugee crisis in the spring of 1939 and the deportation of Hungarian Jews five years later? The following photos and links were provided by our friend Jack WV. Posted on April 27, 2014 with 31 notes. Sir Nicholas Winton didn’t intend to save children from the Nazis when he went to Prague on the eve of World War II, but he had a burning desire to help refugees who were crowded around the city. In the end, with the help of a little trickery, Winton pulled off one of biggest humanitarian acts of the war when he helped arrange the safe transport of 669 mostly Jewish kids from Nazi-occupied Czechoslovakia to Britain. Bob Simon speaks to Winton, now 104, and to some of the people he saved, on the next edition of 60 Minutes, Sunday, April 27 at 7 p.m. ET/PT. Jack WV informs us that Sir Nicholas Winton will turn 105 on May 19th! Here are excerpts from the transcript of the 60 Minutes documentary about Sir Nicholas Winton’s efforts. The complete transcript can be found here. The following script is from “Saving the Children” which aired on April 27, 2014. Bob Simon is the correspondent. Harry Radliffe and Vanessa Fica, producers. Now, an extraordinary story from the Second World War — a humanitarian story that didn’t come to light for decades. It concerns a young Londoner named Nicholas Winton who went to Prague, and ended up saving the lives of 669 children, mostly Jews, from almost certain death. His story begins at the end of 1938, with Europe on the brink of war. In Germany, violence against Jews was escalating and the infamous Munich Agreement paved the way for Hitler’s armies to march unopposed into Czechoslovakia. In London, Nicholas Winton had been following events and knew that refugees fleeing the Nazis were in dire straits. He went to Czechoslovakia to see if there was anything he could do to help. What’s strange is that for almost 50 years, he hardly told anyone about what he had accomplished and for 50 years, the children knew nothing about who had saved them or how. We begin on October 1st, 1938. Nazi troops marched into the Sudetenland, the German-speaking region of Czechoslovakia. Prague, the Czech capital was flooded with desperate people, trying to escape. A fortunate few were able to send their children abroad. These parents, mostly Czech Jews, sensed war was coming and wanted to get their children out. By chance, a cameraman filmed a man holding a boy, a 29-year-old Londoner. His name: Nicholas Winton. Winton set up a small organization with one aim: to get as many kids out, as fast as possible. By the time he returned to London, he had a list of hundreds of children and set out to convince British authorities to take him seriously. He did it by taking stationary from an established refugee organization, adding “Children’s Section,” and making himself chairman. Nicholas Winton: So that eventually they had to adopt me. Bob Simon: So, in fact, you managed to do what you did through a little deception, a little smoke and mirrors? Nicholas Winton: Yes, to a certain extent, yes. Bob Simon: It required quite a bit of ingenuity. Nicholas Winton: No, it just required a printing press to get the notepaper printed. The “Children’s Section” operated from a tiny office in central London. Winton’s mother was in charge. The staff were all volunteers. During the day, Winton worked as a stockbroker. Evenings, he wrestled with the British bureaucracy. Bob Simon: Did you approach any other countries to take some of the children? Nicholas Winton: The Americans. But the Americans wouldn’t take any, which was a pity. We could’ve got a lot more out. Winton had written President Roosevelt, asking the U.S. to take in more children. A minor official at the U.S. Embassy in London wrote back — the U.S. was “unable” to help. Britain agreed to accept the children, but only if Winton found families willing to take them in. So he circulated the children’s pictures to advertise them. But even after a family chose a child, British authorities were slow in issuing travel documents. So Winton started having them forged. He also spread some money around. Nicholas Winton: Took a bit of blackmail on my part. Bob Simon: You were indulging in blackmail and forgery to get the children out? Nicholas Winton: I’ve never heard it put like that before. Bob Simon: But you seem to be enjoying it. Nicholas Winton: It worked. That’s the main thing. The first 20 children left Prague on March 14, 1939. The next day, German troops occupied Prague and the rest of Czechoslovakia. Hitler rode through the streets triumphant. Hugo Meisl was 10 years old. It wasn’t long before violence against Jews, property confiscations and forced labor that began in the Sudetenland spread throughout Czechoslovakia. But the Nazis allowed Winton’s trains to leave – in keeping with their policy to “cleanse” Europe of Jews. Hugo Meisl’s parents decided it was time to put him and his brother on one of the trains. Over the spring and summer of 1939, seven trains carried over 600 children through the heart of Nazi Germany to Holland, where they took a ferry to the English coast. From there, they caught a train to London. An eighth train — carrying 250 more — was scheduled to leave Prague on September 1st. But that’s the day the war began. Nicholas Winton: They were all at the station. Even on the train, waiting to go, and war was declared. So the train never left. Never heard really what happened to all those children. Bob Simon: But there’s reason to suspect that not many of them survived? Nicholas Winton: I think that’s true. Yes. Two years after that last train, the Nazis began implementing the “Final Solution” their plan to slaughter all the Jews of Europe. Czech Jews were rounded up and shipped to Theresienstadt, an old military garrison town about an hour north of Prague — their first stop on the road to annihilation. These tracks were the exit from Theresienstadt. The only exit. The tracks led east. The trains were called Polish Transports. 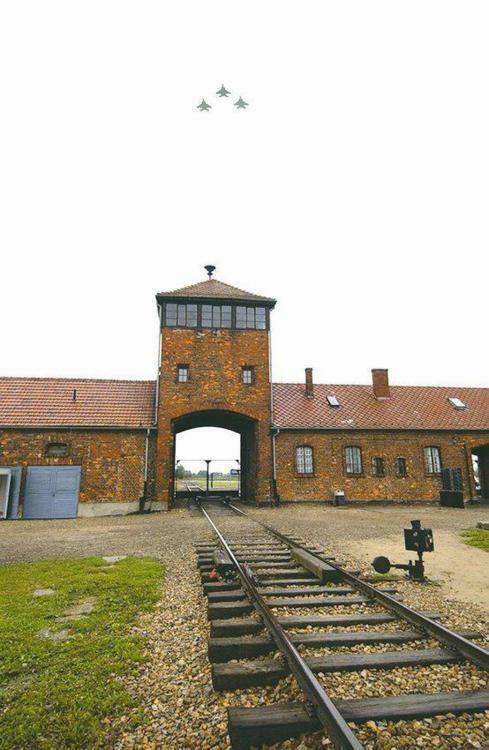 Destination: Auschwitz. Some 90,000 people took that one-way ride. Among them almost all the children Sir Nicholas wasn’t able to get out in time, their parents and the parents of the children already in England. The name of every Czech Jew murdered in the Holocaust is painted on the walls of Prague’s Pinkas Synagogue. Over 77,300 names, including Arnoshtka and Pavel Meisl — Hugo’s parents. And Nicholas Winton? During the war he volunteered for an ambulance unit for the Red Cross, then trained pilots for the Royal Air Force. He got married, raised a family, earned a comfortable living. For 50 years, he told hardly anyone what he had done. “Other things.” For the last 50 years, Winton’s been helping mentally handicapped people and building homes for the elderly. Nicholas Winton: We’ve just opened our second old people’s home, and it’s full. And it’s doing very well. And there are plenty of old people like me to go in. Bob Simon: Yes, but you’re not there. You’re at home. Nicholas Winton: Oh, I’d hate to go into one of my own homes. Don’t print that. In 2003, Winton was knighted – and became Sir Nicholas Winton. In the Czech Republic, he’s become a national hero. And he was celebrated in a documentary called “Nicky’s Family,” but he isn’t really comfortable with all the adulation. Nicholas Winton: I’m not interested in the past. I think there’s too much emphasis nowadays on the past and what has happened. And nobody is concentrated on the present and the future. In 1939, Nicholas Winton used a two week vacation to go to Prague and ended up saving the lives of 669 children. In the decades since, of course, the children had children, who then had children and so on…and the numbers multiplied. Lady Milena: — and ends up with 15,000 children? Bob Simon: It’s a pretty good story. Lady Milena: It’s a great story. Nicholas Winton: They’ve got children and grandchildren and great grandchildren. Bob Simon: And none of them would be here if it hadn’t been for Sir Nick. Nicholas Winton: That’s right. Yeah. Yeah. Terrible responsibility, isn’t it? This entry was posted on April 27, 2014 at 11:46 PM	and is filed under Uncategorized. You can follow any responses to this entry through the RSS 2.0 feed. You can leave a response, or trackback from your own site. Thank you for the information. Pray for Israel. Please send me Sarah’s Facebook posts via email. Thanks again.